I'm very happy to present a little addon pack (by request!) to my Knit & Stitch kit for the crocheters out there... I have for you the Knit & Stitch Crochet Add-on Pack! By request from jetfuelonly. (and butterflies by request of lwlittlebit!) I whipped up a few little extra pieces to add to Knit & Stitch for those who love to crochet. It's timed beautifully with my own personal experience in crochet -- I just taught myself this week actually, after a failed attempt to learn at Christmas. And by fail I mean that I just couldn't figure it out on my own and gave up. I've been nagging at myself to try again, and I finally got the hang of it on Tuesday and have been happily practicing and learning more since. 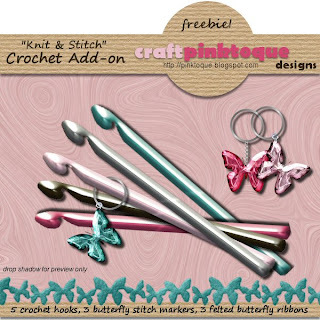 The Knit & Stitch Crochet Add-on comes with 5 metal crochet hooks in several kit coordinating colours, 3 felted butterfly ribbons, and 3 new butterfly gem stitch markers. I hope you like it! Download the add-on pack HERE. So sticking with knit & stitch news, I completed a scarf for myself recently and have started a second one done in a similar fashion that I plan to give my mom for Christmas. While we were vacationing in the Okanagan a few weeks back I picked up some big size 15 needles and some soft Bernat yarn that was on clearance... one big skein in burgundy & rose and one big skein in purples. I didn't use a pattern per se, but just cast on 20 stitches and knitted until the scarf was as long as I wanted it to be. I have a scarf that I was given a few years ago that is 100 inches long and it's too long for me, so when knitting this one I wanted to stop at a length that was more comfortable. That length turned out to be around 65 inches. I used big loose stitches on those big needles and fondly refer to the finished product as my loopy scarf. I've decided to make a slight change in the "pattern" for my mom's scarf: I think 20 stitches wide in this gauge is maybe a tiny bit too wide, so on my mom's purple scarf I've only cast on 15 stitches. I think I like the width of hers better. She's only a little shorter than I, so I'm thinking 60-65 inches long will be good for her also. I'm looking forward to finishing this one! And since I mentioned my newly learned self-taught crochet abilities, I should maybe share it! Here's a little peek at my practice swatches and first attemps at spiraling and going beyond just the single crochet stitch. I've practiced single and double crochet and feel confident about those two stitches so far. And yesterday I successfully created my first flat round spiral! I know, baby steps... but I see a lot more crochet in my future, it's so fun and quick! YAY for finally learning crochet. OMGosh...Thank you so much they are gorgeous!!! Thanks so much for sharing this pretty ad-on with the butterflies! Love, Love Love the crochet add on kit. It seems crocheters always get overlooked. Thanks for this!